Giuseppe Conte resigned on Sunday to form a government in Italy because he found difficulties to elect his Executive. The lawyer made the decision after the president, Sergio Mattarella, rejected his candidate for Economy Minister. This way a serious institutional crisis is opened, which surely leads to anticipated general elections for next autumn. After 84 days of negotiations, characterized by confusion and chaos, Italy is facing an unprecedented institutional crisis, the most serious in its republican history, which will surely lead to early general elections next fall. The announcement of the acceptance to form Government was read by the Secretary General of the Headquarters of the State, Ugo Zampetti, in the press room of the Quirinal, headquarters of the Italian Head of State, expressing that Conte returned the order that he had accepted. 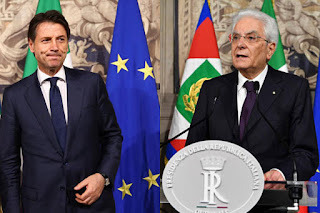 The news has caused chaos in the European nation and recently leaders LN, Matteo Salvini and the M5S anti-system, Luigi Di Maio, met with Italian President Sergio Mattarella to analyze the situation. The institutional fracture had as protagonist a hard struggle of power in which the ‘5 Stars Movement’ and the ‘Northern League’ constantly insisted, with arrogance and threats, to impose on the head of the State as Minister of Economy, 82 years old Paolo Savona, a Eurosceptic millionaire economist. But the president, 76 years old, hasn’t given in to the pressures and threats of the populists and has vetoed Savona. The League had affirmed that it would not back down about Savona and that in case of veto of the Head of the State, the only possibility will be returning to vote. According to sources at the Presidency, although it is unknown what is the motive, after the announcement Mattarella called for a meeting to Carlo Cottarelli, a 64-year-old economist, former director of the International Monetary Fund and former commissioner for the reduction of public spending in Italy. Some Italian media believe that it could be the figure in charge of forming a technical government to get the country out of the political paralysis in which it finds itself. Some Italian media believe that it could be the figure in charge to form a technical government to remove the country from the political paralysis in which it is submerged. The truth is that we still do not know how this situation will end, however, probably this crisis will lead the European country to general elections early next fall.